The mastermind jewelers at The Great Frog have just conjured up this treat of a ring. Sticking to one of their favorite topics, skulls, they have added some extra detail to the sides, and a lower jaw (most skull rings found in The Great Frog store are lacking a lower jaw). If you don’t know about The Great Frog, let me fill you in on a few details. 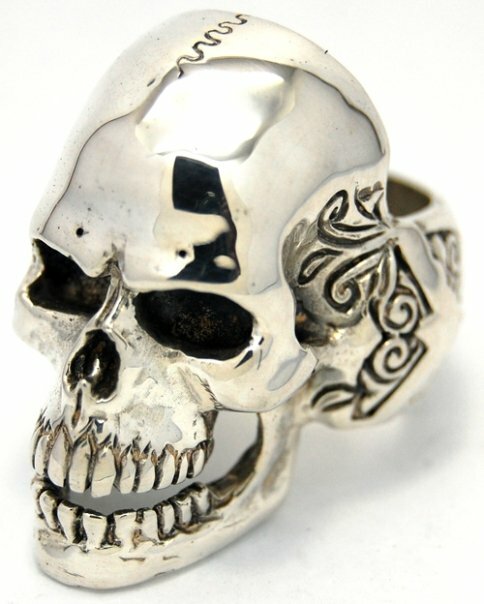 Founded in 1972, The Great Frog is a pioneer in hand crafted silver jewelry with a slightly darker twist. In a world where you often buy something and you can feel that there’s 10,000 identical machine-rattled-off versions in the UK, The Great Frog still hand make all of their jewelry on site at their Soho based store, meaning that every single piece is a one off. You can buy their jewellery online, but I strongly suggest buying it from their London store. You need to make sure these beauties fit perfect, and to do that they will measure your finger and adjust the ring in-store that day. Now that’s service!